TGx:Details for torrent "[ FreeCourseWeb ] PluralSight - Using OpenAPI-Swagger for Testing and Code Generation in ASP.NET Core"
Torrent details for "[ FreeCourseWeb ] PluralSight - Using OpenAPI-Swagger for Testing and Code Generation in ASP.NET Cor..."
Testing an API improves its reliability. Generating client-side code helps with getting started fast when building a client that consumes your API. OpenAPI can help with both. In this course, you'll learn how.Testing an API improves its reliability. Generating client-side code helps with getting started fast when building a client that consumes your API. OpenAPI can help with both. In this course, Using OpenAPI/Swagger for Testing and Code Generation in ASP.NET Core, you will gain the ability to test an API and generate code from it. 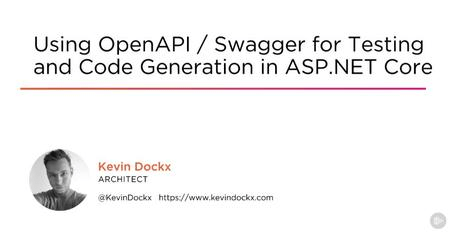 First, you will learn what OpenAPI (Swagger) is. Next, you will discover how it can help with code generation. Finally, you will explore how to test your API, from manual to automated and command-line testing. When you’re finished with this course, you will have the skills and knowledge of .NET Core and OpenAPI needed to test your API and generate client-side code from it.